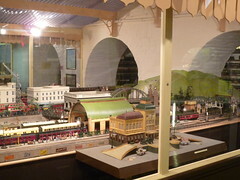 Toy and Model Museum – This museum costs £4 and if you’re a particular fan of model trains then you’ll want to check it out. The central collection of trains and tracks looks impressive but after pressing the start button only one locomotive runs. 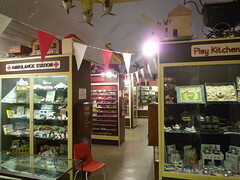 The collection also house other period toys, tin models, railways and dolls. 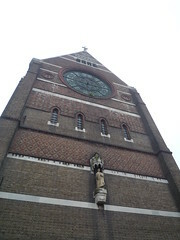 St Bartholomew’s Church – I’d read that St Bartholomew’s Church was something to check out due to being the ‘tallest church‘. Besides that there’s not a great deal to recommend it. 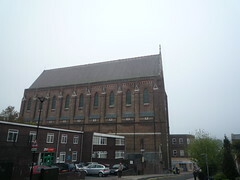 While certainly a nice church it’s nothing to write home about. 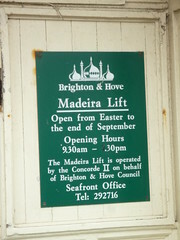 Madeira lift – Not an attraction per se but while walking toward the Undercliff I randomly found the Madeira Lift. 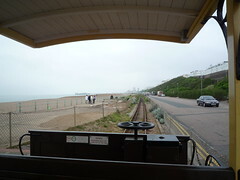 It’s basically just a lift and it takes you down to the beach (through the Concorde 2 bar). Basically it’s just random! 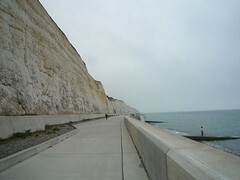 Undercliff Walk – A coastal walk from Brighton and Saltdean. Walking it was somewhat disappointing and I don’t think it was just the weather. After taking 20 minutes just to get past the marina I was now properly walking next to the white cliff face with uninterrupted views of the sea on the other side. I felt small next to the steep face and rather peaceful looking out on the sea. This lasted for about 20 mins before the constant monotony set in. The unending parallels of cliff, path and water weighed heavily. You can’t readily leave the walk (which made me ponder what would happen if there was a storm or less likely a tidal wave). 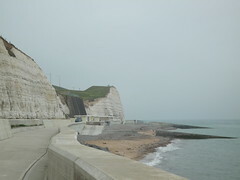 By the time I reached Saltdean I’d been walking for about 1.5 hrs (and you can go on a bit further). 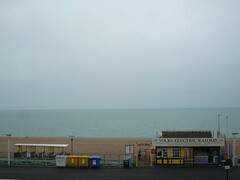 I walked up to the high road and caught a bus back to Brighton. If you have a bike then the ‘walk’ might be a lot more fun. If you go on a sunny day don’t forget to bring some water with you. 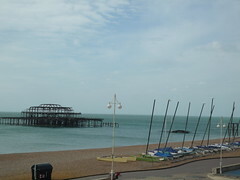 West Pier – Not an attraction per se but the ruins of one of Brighton’s piers is on the shore and a good starting point to walk along the beach towards Brighton Pier. 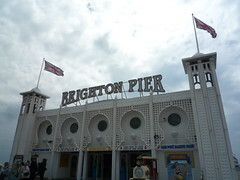 Brighton Pier – This pier is filled with carnival attractions (some may close depending on weather), video games, poker machines and food outlets. The Lanes – Similar to North Laine, the Lanes consists of a multitude of small shops, eateries etc dispersed throughout a number of winding lanes. While not as extensive as I’d imagined it was still interesting to walk around. 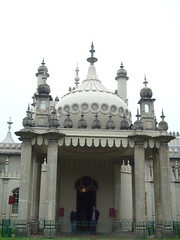 Royal Pavilion – This former Royal Palace is probably one of the major attractions in Brighton. You’ll be charged £8.80 and get a complimentary audio tour. 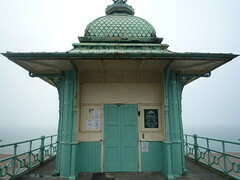 The Pavilion with its distinctive domes and turrets is now owned by the city with most of the fittings on loan from the Queen. The Pavilion is an excellent example of Chinoiserie and Regency decor. Some of the most notable rooms are the Banqueting Hall with its impressive dragon ensnared chandelier, the ‘modern’ kitchen and the music room with its hand woven carpet and gold cockle ceiling. No photography is permitted inside. 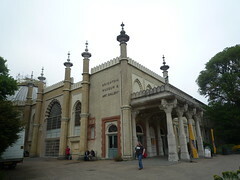 Brighton Museum and Art Gallery – This museum is located in the same park as the Royal Pavilion and its free (unless there are special exhibits on). It’s reasonable and varied but not spectacular. 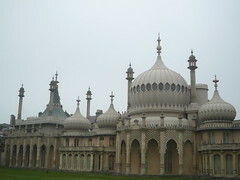 In addition to a history of Brighton the museum had sections on world cultures, ceramics, art deco and Egyptology. 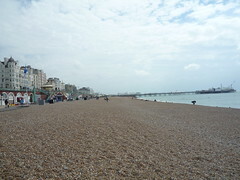 Brighton surprised me by having a high density of cafes and eateries. Here are the ones I visited but there are plenty of others! Red Roaster – This cafe had been recommended and it seems popular with the locals but I found it wanting. My mocha only had the barest hint of chocolate and was generally weak. While the environment was cosy the wall colour is a very bland light beige. My sandwich was reasonable and filling. Tic Toc Cafe – I definitely enjoyed this cosy cafe located in the Lanes with its light atmosphere, couches and decorated walls. The mocha was delightfully sweet without the need for extra sugar. The staff member was also friendly and helpful. Scoop and Crumb – This cafe has a wide selection of sundaes and waffles. It claims to have the largest menu in the UK. Even my dull sounding choc fudge sundae was tasty and comes topped with a few streamers! Bill’s Produce – Beyond the plastic flaps at the entrance you’ll find a small but plentiful fresh produce selection. Rustic wood tables are in the middle. One wall is filled with canned and bottled produce and the other side is where the display cabinets (sandwiches etc) and cooking are done. Prompt friendly service. While I initially thought that the volume of food (compared to London prices) was badly skewed I was mistaken. Not only did the food smell and taste wonderful but by the end of the meal I was satisfyingly full. Shakeaway – An ice cream shake shop. Fairly expensive and is popular with tourists and young people. While tasty and filling I just don’t get the hype. Perhaps I’m just too familiar with Cold Rock to be impressed? 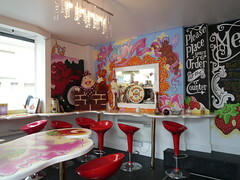 Choccywoccydoodah – Great atmosphere, very fun and an array of tasty chocolate. Mocha was good and had the option to use their brand of white, milk and dark chocolate. A little bit costly but worth it. Pompoko – This Japanese restaurant was cheap and the servings while not enormous were reasonable and the food was a decent quality. The food was served quickly and the staff were friendly. A caveat on this section. I went out on a Tuesday night and as a result every bar we went to (and those we skipped) were all quiet. 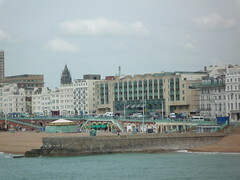 Brighton has many other bars to check out as well. The Mash Tun – A student bar with outside seating. I thought that the on tap beer price was a bit excessive but besides that it’s a fairly stereotypical bar. 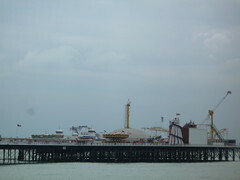 The Windmill – A little further out from the centre of Brighton (not a big thing in small Brighton). Prices were reasonable, staff friendly and a fairly relaxed atmosphere. Unfortunately due to lack of numbers I can’t comment about the type of clientele. Heist – A cocktail bar with leather couches and tables on one side and bar stools on the other. Even on Tuesday this bar had quite a few people ranging from young student types to the middle aged. Our cocktails were fairly good and not too expensive. Royal Pavilion Tavern – Luckily, we made it to the upstairs club area while it was still free entry. Apparently Tuesday is indie night and while I’m no expert it’s probably fair to say it was more heavy/rocky than indie. Plenty of people some even danced but sadly I wasn’t feeling the music enough to dance. That or I wasn’t drunk enough – difficult given the queues at the bar (lack of staff?). Map at Google and photos at Flickr!